facts about Banded Angelfish, "Scientific name for Banded Angelfish is Apolemichthys arcuatus". The banded angelfish is also referred to as the Bandit Angelfish, Banded Angelfish and the Black-banded Angel in most parts of the world. The species of the Banded Angelfish primarily inhabits the Eastern Central Pacific specifically Hawaiian salty waters and locations with rocky reefs where there are particular abundance caves and ledges. Banded angelfish, however, is not common in areas with rich corals. The Banded Angelfish belongs to the Pomacanthidae family. Juvenile Banded Angelfish are common in most tank aquariums but the adult Banded Angelfish are not due to their specialized sponge and algal diet. The Banded Angelfish is an overall pale species of fish with an expansive black bar which is bordered by a thin and pearly white band that cuts across the upper side of the Banded Angelfish from anterior of the eye to the posterior part of the soft dorsal fin. A comparable wide black band with lustrous white border runs sub-marginal on the caudal fins. The shimmering whites to grays make the majority of the Banded Angelfish body color. An individual Banded Angelfish thrives in a tank aquarium of at least a hundred and eighty gallons (681 liters) of water and since it is a shy fish, requires plenty of hiding places. 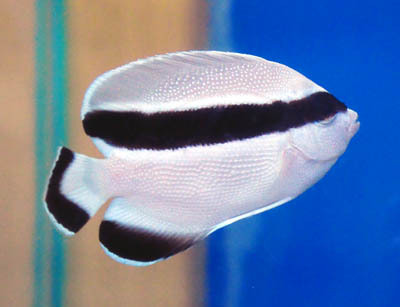 Once the Banded Angelfish establishes itself in a tank aquarium, it may become territorial and aggressive to other fish later introduced into the aquarium. The Banded Angelfish prefers mainly a marine setting and is not a food reef dweller as it has a habit of nipping on clam mantles, soft and hard corals. Banded Angelfish species are hermaphroditic and therefore very difficult to breed in any tank aquariums since the male and the female are indistinguishable by coloration. The fact is that a Banded Angelfish are omnivorous, (definition-they eat both other animals and plants). The feeding habit of the Banded Angelfish makes the fish very difficult to acclimate in a tank aquarium since it mainly involves the natural diet. However, the Banded Angelfish does well with a diet that contains live rock for grazing, marine algae. When you first get your Banded Angelfish, it may need to be given live foods such as freshly chopped seafoods or vitamin fortified shrimp or to encourage them to eat. In the wild Banded Angelfish like hiding in areas near caves where there is soft and stony corals. That's were the Banded Angelfish feed on tunicates, sponges benthic algae and weeds. Ideal water temperature for your fish is between 72 to 78º F (22 to 25.5º Cel) and pH from 8.1 to 8.4. The specific gravity at 1.020 to 1.025. Test the water when preparing your tank for your Banded Angelfish: You will need to purchase a liquid tester so that you can test for Nitrates and Ammonia. The strip-style test kits are unreliable and a waste of money. You should use a dechlorinating product to remove the harmful chlorine from the water. Test for nitrite, ammonia, and proper PH. The ammonia should always be 0, the nitrite should be 0, and the nitrate should preferably be below 20 ppm. If it's at or above 40 parts per million (ppm), you have too many fish or are not changing the water often enough. Cycling your tank is important, Follow the steps to cycle your tank. This establishes healthy bacterial and chemical levels. When buying your Banded Angelfish see which one looks like the healthier fish in the tank. Be wary of tanks with dead fish in them, as this can be a sign of illness or improper care. Clamped fins are a sign of illness. In addition, healthy Banded Angelfish will have no white spots, make sure they swim with their fins held upright, and have a nice rich color or colors. Make sure they swim all over the tank and look healthy. When adding the Banded Angelfish to the aquarium, it is important to introduce the fish to the tank environment slowly. As soon as you get home, float the entire, closed pet store bag (with the Banded Angelfish inside!) in the tank on top of the water for about a half hour. This will allow the water in the plastic bag and the Banded Angelfish to equalize out to the same temperature as in your tank, so your Banded Angelfish does not get shocked by the different temperature. Next, add a small amount of water from your tank to the bag, and wait about 15 minutes. Do this at least one more time. Us a net to catch your Banded Angelfish and then while the fish is in the net, dispose of all the water down a drain or outside. Then transfer the Banded Angelfish carefully into the your tank. This process not only reduces stress for you Banded Angelfish, it also prevents the dirty pet store water from contaminating your tank with disease. Remove 30% of the water from you Banded Angelfish tank each month with new water, or a 15% water change every 2 weeks is ideal for keeping nitrates lower. With corals in the Banded Angelfish tank, then 20% water change every month, or 10% change every 2 weeks.